We know a lot of you aren't interested in Android, let alone considering installing it on your precious TouchPad. That's fine, this guide isn't for you. There are plenty of TouchPad owners who are and they have plenty of legitimate reasons to do so. Be it to get apps like Netflix on their tablet, to see what all the fuss is about widgets, or merely for the novelty factor of installing a second operating system on a TouchPad, there are reasons to do it. This guide will go over how to install the CyanogenMod 9 Android build on the HP TouchPad. CyanogenMod is a third-party open source distribution of the Android Open Source Project, with CyanogenMod 9 (CM9) based off of Android 4.0 Ice Cream Sandwich (ICS). It offers all of the core features of Android, though it does not come with the Google services integration that has come to be associated with the majority of commercial smartphone and tablet distributions of Android. PLEASE READ THIS ALL THE WAY THROUGH BEFORE ATTEMPTING. WE WANT YOU TO HAVE A GOOD UNDERSTANDING OF WHAT YOU HAVE TO DO BEFORE YOU GET HALFWAY THROUGH AND PANIC. OKAY? OKAY. First and foremost, before doing any sort of hacking to your device, you should be mentally and physically prepared for any and everything to go wrong. Yes, this install process is relatively safe so long as you follow the instructions, but things can and have gone wrong. So make sure your TouchPad is successfully backing up to HP's servers and make a backup on your computer of all your files, photos, and everything else that you can't redownload. Do it now, before you do anything else. Seriously. Backed up? Good. Now it's time to get your computer set up. Just as with our Homebrew App Installation Guide, you'll need to make sure Java is set up on your computer (chances are it already is). 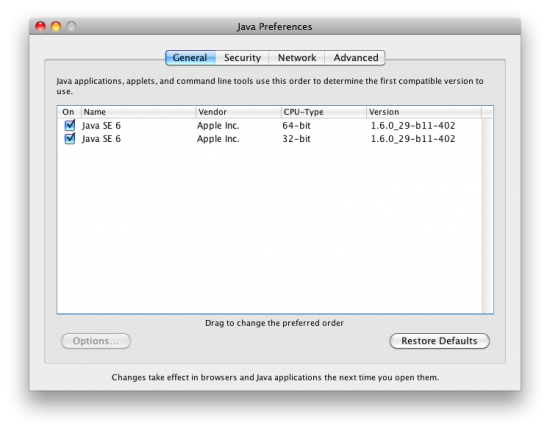 Mac: Open Applications, Utilities, and then Java Preferences. Under the General tab, make sure Java SE 6 is checked on and at the top of the list. If it is not, you can drag-and-drop it to the top. It is okay to have multiple instances of Java checked, so long as Java SE 6 is one of them. If Java SE 6 is not present, open Software Update from the Apple menu (top left corner) and let it install all pending updates. PC: Open the Control Panel and open Java, this will open the Java Control Panel. In the first box under the General tab click on the About button. 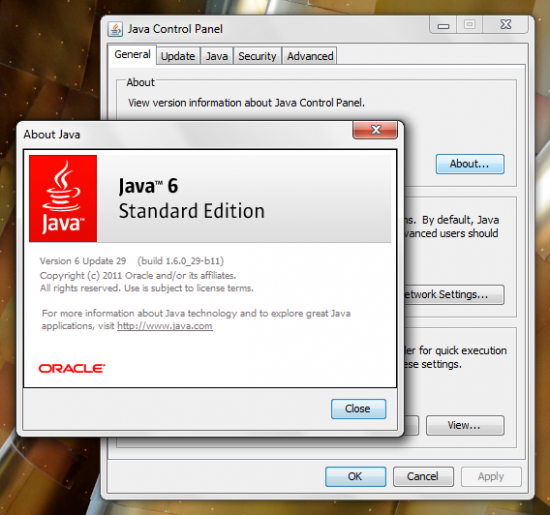 If it says Java 6 Standard Edition, click Close to exit the pop-up and Cancel to close the Java Control Panel. If it does not, or if Java is not present in your Control Panel, go to Java.com and download and run the 'Windows Online' Java installer. Everybody: To enable the needed communications channels with your TouchPad, you'll need to install the Novacom drivers on your computer. If you've installed the webOS SDK or WebOS Quick Install, you've already installed Novacom. 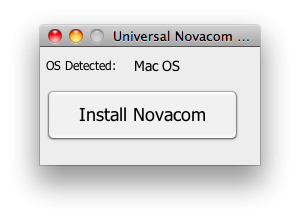 If you haven't or you're not sure, simply download the Novacom installer, open it, click the big "Install Novacom" button, and let the installer download and install the drivers. Note: Do not use Safari to download these files - they need to stay as ZIPs for the installation process and Safari has this bad habit of automatically unzipping packages when downloading. Though not officially available for non-Google-approved devices, the official Google Apps for ICS (Gmail, Latitude, Maps, Play Store, et al) are available online. Because they aren't part of the open source Android or Cyanogen Mod builds, we're not going to go over how to install them here, but suffice to say the process is very much the same, and the files are relatively easy to find if you so desire. Nudge nudge. Wink wink. Now that you have everything needed for the project downloaded or installed we can get started! The first thing you will need to do is take the ACME Installer file and unzip it (if zipped) and copy it to where Novacom is installed. Windows users can expect to find Novacom under C:\Program Files\Palm, Inc or C:\Program Files\HP webOS. Mac users can get to where they need to go by opening Finer's Go menu, selecting Go To Folder… and entering /opt/nova/bin. Once you're in the appropriate folder you should see files/folders named nocavom and novacomd (and possibly others). Copy the unzipped ACMEInstaller2 file into this folder. Turn on your TouchPad and connect it to your computer with a USB cable. Once you connect it to your computer, the TouchPad will alert you asking if you want to charge or enter Mass Storage Mode. Select Mass Storage Mode to mount your TouchPad as a USB drive,allowing access to files on the device from your computer. It should appear as a device name HP TouchPad. Open the TouchPad device in your computer's file browser, create a folder (PC: Right click > New > Folder; Mac: Right Click or control+click > New Folder), and name it "cminstall". Copy the ClockworkMod Recovery, MOBoot, CM9, and whatever other zip files (*cough*Google Apps*cough*) you're installing into that folder. Eject the TouchPad from your computer and unplug it. With us so far? Good. Take a deep breath, because we're going to get technical here. Things will look scary, but so long as you do exactly as we say, you'll do just fine. Boot your TouchPad into recovery mode by shutting it down (hold down the power button and select Shut Down) and restarting while holding down the power and volume up buttons until the USB symbol appears on the TouchPad's screen. Plug the USB cable back into the TouchPad and your computer. If your computer needs to install the proper drivers, it'll say so (it shouldn't take much longer than a minute or two to install the drivers). Now it's time to jump into Command Prompt or Terminal on your computer to get the ball rolling. Mac: Open Terminal (Applications > Utilities > Terminal). Once the Terminal window is open, type (without quotes) "cd /opt/nova/bin" and hit enter. A new line will appear with "bin" inserted between your computer name and username. Type (sans quotes) "./novacom boot mem:// < ACMEInstaller2" and hit enter. PC: Open Command Prompt by going to the Start Menu and typing "cmd" into the search box. Once the Command Prompt window is open, type (without quotes) "cd c:\Program Files\Palm, Inc" (substitute Palm, Inc for HP webOS if necessary) and hit enter. A new line will appear with c:\Program Files\Palm, Inc and a blinking cursor. Type (sans quotes) "novacom.exe boot mem:// < ACMEInstaller2" and hit enter. Everybody: If all has gone according to plan, your TouchPad will quickly restart and a bunch of lines of code you likely don't understand will start streaming across your TouchPad's screen. This is the installation happening, just let it go. This will go on for several minutes, so now would be the time to go have yourself a stiff drink, because the hard part is over. Once the installation is complete, your TouchPad will restart again, but this time it will now stop first at a new station called moboot. This screen lets you select which OS you want to boot into. Your options will include boot webOS, boot CyanogenMod, boot ClockwordMod, boot webOS recovery, reboot, and shutdown. Use the volume rocker (up is up and down is down) to cycle through the options and press the home button to boot into your selected OS. Typically all you'll need to pick from is boot webOS or boot CyanogenMod. If at any time you want to switch between Android and webOS you'll have to shut down and reboot the device. Rebooting Android is accomplished by holding down the power button, selecting Reboot, and tapping OK. webOS can be rebooted by holding down the power button, selecting Shut Down, and then turning the device back on (hold down the power button) after it has turned off. The boot process will stop at moboot each time your reboot the tablet, though the initial selection defaults to CyanogenMod with a five second timeout period, so you'll want to pay attention if you're intending to boot into webOS. Congratulations! You now have two wonderful operating systems on one awesome tablet. We have more coming down the pipeline on how to deal with having Android on your TouchPad and what to do with it, so keep your browser tuned right here to webOS Nation!